The trick is to convince the powers that be of the value of marketing automation. To succeed, you need to get inside the heads of your CEO, head of Finance, and head of IT and craft a persuasive argument in the language they understand. This quick guide will help you do just that. 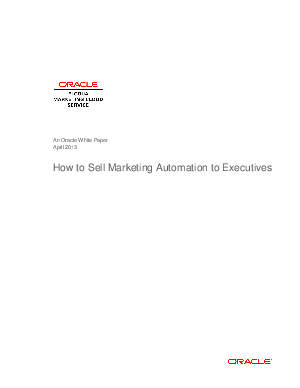 Oracle works with thousands of sales and marketing professionals who have already gotten executive buy-in and are benefiting from Oracle’s marketing automation power. This paper shares their insights about what keeps executives up at night, how they view the marketing department, and how marketing automation can address their concerns and win them over.